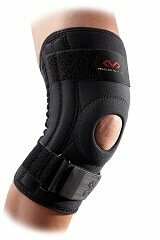 Advanced knee braces provide moderate support and protection for the most common causes of knee pain. They are really easy to use, either being simple pull up sleeves or fastening with Velcro straps to provide the right level of support and compression required. 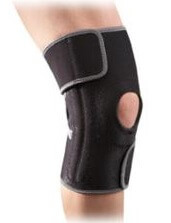 2)	Longer term use: with ongoing knee conditions causing mild to moderate pain. 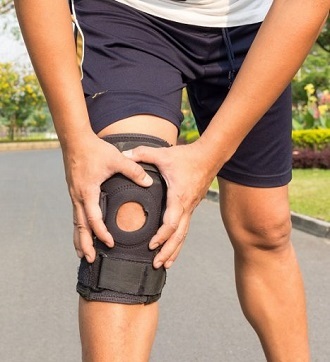 Advanced knee braces are perfect for moderate knee pain, weakness and instability, and conditions such as ligament injuries, Runners Knee, Patellar Tendonitis and knee swelling. These knee braces are not suitable for severe instability and pain – in those cases you will need an elite level brace. Any incidence of knee pain or instability should be evaluated by a doctor. Most knee braces in this category are a wrap-around style with adjustable Velcro straps allowing you to ensure an accurate fit, but there are a couple of pull up sleeves that offer advanced protection. They all tend to have a hole at the front to help support the kneecap and improve patella tracking without putting pressure through the kneecap or knee bursa. Knee straps also fall into the advanced protection category, and are particularly useful for conditions such as Chondromalacia Patella and Runners Knee. They are covered in depth in the knee straps section. 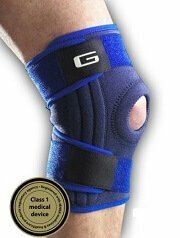 Overview: This Neo G brace provides great support and compression. It has metal spiral supports at the sides stabilize the knee without hindering movement, making it particularly good for sports. It has the added advantage of three adjustable straps (most braces only have two) which allows you to control the level of compression and support to make sure it fits perfectly. It is a Class 1 medical device registered with the Medicines and Healthcare products Regulatory Agency. My verdict: This is one of the best knee braces on the market offering advanced support and protection. Neo G is one of the newer brands for braces but are becoming extremely popular due to good user reviews. This brace is very reasonably priced and proves that knee braces don’t have to be cumbersome to give great support. Average user rating 4.3/5. Overview: This is one of the most popular McDavid knee braces for ligament and cartilage injuries, and also helps relieve the symptoms of Chondromalacia Patella, patellar subluxation and patellar tendonitis. It has special supportive steel springs that strengthen the brace on either side of the knee joint to improve stability and support the ligaments. The McDavid Patella Knee Support also has a supporting padded buttress around the kneecap to improve patellar tracking. The neoprene material provides soothing heat and compression which relieves knee pain and swelling and promotes healing. My Verdict: This is a classic design brace rated highly by users. It is fully adjustable making it really comfortable to wear and removes the worry about buying the right size. If you are looking to get a bit more support than a classic pull up design, it is well worth the money. Average user rating 4.1/5. Overview: This ACE brace provides moderate support and stability by simulating the action of the knee ligaments without restricting normal movement. It has flexible metal side stabilisers providing medial and lateral support. The ACE Brace With Side Stabilizers is designed for use with arthritis, general knee soreness and swelling and supports weakened muscles, tendons and ligaments to help reduce the risk of injury. My verdict: If you want something cheap but with more support than a basic brace then go for this one. Users rate it highly for comfort, support and durability. If however you want an improved fit, then invest in a wrap-around brace. It will cost you more but could work better. Average user rating 4.2/5. 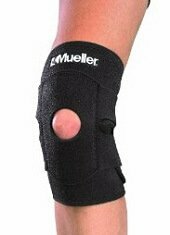 Overview: This Mueller knee brace is a lightweight, adjustable support that provides firm, comfortable compression without restricting movement. It is perfect for weak, injured or arthritic knees. Four patented straps provide controlled compression and a perfect fit for your knee - especially helpful if you knee is prone to swelling. My verdict: People find this brace really comfortable even when worn all day. It doesn’t cause any restriction behind the knee like some pull on sleeves do. Average user rating 4.1/5. Overview: Flexible dual side stabilizers provide support and side to side stability when you walk, bend, run, jump or climb. This allows full range of movement whilst delivering comfortable support and protection. The ACE Knee Brace With Side Stabilizers has adjustable straps to ensure optimum fit and prevent it from slipping down. The comfort fit sleeve reduces irritation behind the leg, and breathable material keeps you cooler and drier. An antimicrobial treatment stops bacteria from thriving, giving you an odor-free brace. My verdict: This is a popular advanced brace however some people find it a bit uncomfortable as the middle strap behind the knee can rub and restrict movement. Average user review 4/5. Choosing a brace can be difficult, especially as there are so many different ones on the market. If you are experiencing mild pain, or are looking for some gentle support following an injury such as a sprain, a Basic Level Brace should be perfectly adequate for you. If you have had a serious injury and need maximum support, you will probably need an Elite Level Brace to provide you with adequate support and prevent further injury. To find the best brace for you, visit the Knee Brace Guide to find out about the different styles of brace available, what conditions they are suitable, and which ones are my Star Buys, based on the opinions of people just like you. Where knee braces come in more than one size, it is important to get the right one otherwise they won’t work effectively and may be very uncomfortable. Measure around the widest part of the knee and choose from the options below. If your size falls between two sizes, it is usually best to go for the larger size for a better fit.